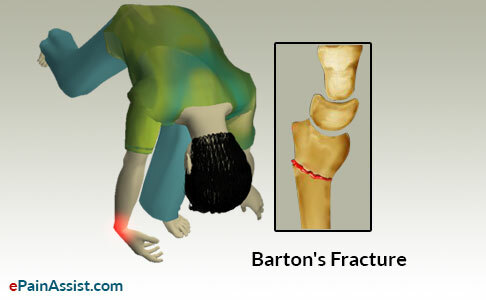 Which among the following is Barton’s fracture of the wrist? Barton fractures are dorsal or volar rim fractures of the distal radius. The dorsal rim fractures result from a dorsiflexion and pronation force, whereas the less common volar rim fracture is produced by a fall on the outstretched hand in supination. These injuries are often fraction-dislocations or subluxations, because the carpus is frequently displaced in the direction of the fracture. Accompanying ligamentous injuries create radiocarpal instability. This instability is not fully appreciated in the acute setting but may lead to various secondary carpal instability patterns and premature degenerative arthritis.